No pets in allowed cabins or any onsite dwellings. We are camping pet friendly ONLY. Under the Caravan Park and Camping Grounds Act and Regulations pets are NOT allowed in any onsite park accommodation or facilities at any time. Pets must not be left alone, on-site, at any time during the guests stay. Boarding Kennels are available nearby for a small fee if needed. Pets must not be allowed to bark or indulge in antisocial or destructive behaviour. As the pet owner you accept full responsibility for any personal injury or damage caused by your pet whilst in our park and reserve areas. The park washing machine, laundry trough and driers must not be used for washing pet bedding. The Park laundry, ablution facilities, pool and barbecue areas are out of bounds to all pets at all times and under no circumstances may they be used for bathing pets. We regret we are unable to permit very large dogs or dogs of a breed that may cause other guests to experience anxiety or fear for their safety. Any dogs registered as a dangerous breed are expressly barred from entering the park. 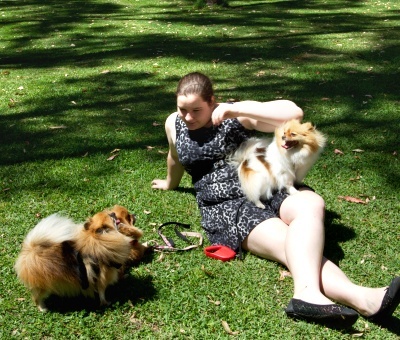 The decision to allow a guest with a pet into the park is at the managers absolute discretion at all times. The manager reserves the right to ask any guest with a pet to leave immediately if the above rules are not complied with or the pet is causing a nuisance. These conditions are aimed at ensuring everyone has an enjoyable stay at our park. Please consult the Managers for any further information you may require.